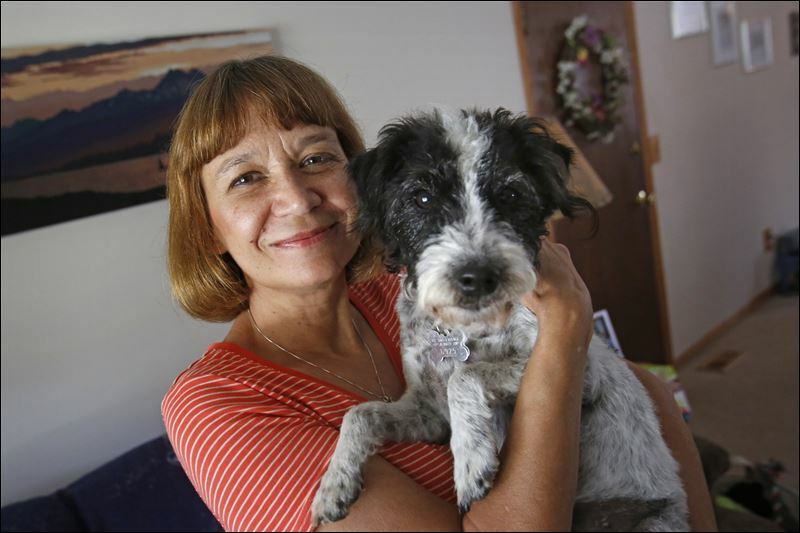 Linda Pittman and her eight-year-old Fell terrier Molly was diagnosed with leptospirosis, a bacterial infection that can cause flulike symptoms and affects the liver and kidneys. Ms. Pittman’s other two dogs have not tested positive for the illness. Linda Pittman’s dog Molly is being treated for leptospirosis, a bacterial disease that affects both animals and humans. The disease, commonly known as lepto, is more prevalent this year because of the rain. Even dogs that have been vaccinated against it — such as Molly — can contract it because the vaccination does not protect against all its many strains. And humans can get it too. Ms. Pitman of Ypsilanti, Mich., had her two other dogs checked for the disease because it is contagious via urine. Fortunately, the two dogs, including Gracie, who was adopted from 4 Paws Sake, a Toledo-area rescue group, both have tested negative thus far. “I was told that wildlife urine exposure is a prime way to acquire lepto, and we have squirrels and racoons and possums and mice and all kinds of critters in this area, passing through our yards and peeing wherever they want,” Ms. Pittman said. Molly, an 8-year-old Fell terrier, was seen first by her regular vet, Dr. Vicki Marsh, at Animal Kingdom Veterinary Hospital in Ann Arbor. Dr. Marsh referred Ms. Pittman to the Michigan State University College of Veterinary Science, which has an out-patient clinic. The internist who saw Molly at MSU was Dr. Christina Chan. Molly exhibited a symptom that concerned Ms. Pittman and her veterinarian: elevated liver enzymes. Molly is on Doxycycline antibiotics for two weeks and then another lepto titre will be done to see if it has normalized. She is doing fine and is taking her meds in a pill pocket treat twice a day. Ms. Pittman is keeping a close eye on her other two dogs to make sure they don’t contract the illness. They include Mikey, a 7-year-old schnauzer and terrier mix who was rescued from a high-kill shelter in Ohio by a Michigan rescue group. Her Toledo dog, Gracie, will be 4 years old in August. She is a mix of poodle, Yorkshire terrier, and possibly fox terrier. She was fostered for 14 months by Tammy Davis of Point Place, who also volunteers at the Lucas County Dog Warden. Lepto vaccines are often neglected by dog owners because of a higher incidence of allergic reactions to the vaccine, Ms. Pittman said. Lepto is very endemic in northwest Ohio and southeast Michigan, said Dr. Gary Thompson, a veterinarian at West Suburban Animal Hospital in Sylvania Township. “There are over 100 strains of lepto, and we vaccinate for the four most common in the states,” Dr. Thompson said. To help prevent the spread of the disease to pets, keep them away from standing water and areas frequented by wildlife.